The Final Project Summary for the FP7 BioElectricSurface Project has been published and is available for download on the project website. BioElectricSurface Shortlisted for EuroNanoForum 2013 “Best Research Project Award"
The BioElectricSurface project has been shortlisted for the “Best Research Project Award” at EuroNanoForum 2013. Members of the project team will be present at EuroNanoForum 2013 in Dublin at Stand S56 (LANIR / MSSI). The aim of the award is to highlight the innovative outcomes of EU research projects and to present how nanotechnologies enable progress in every aspect of daily life: from health to environment, energy, transport, food and communication. The 11 candidates will be voted on and a winner announced at the ENF2013 on 20 June 2013. EuroNanoForum is Europe’s largest Nanotechnology and Materials Conference. It takes place every two years and receives funding from the EU’s Seventh Framework Programme for Research and Technological Development. ENF2013 (Dublin, 18-20 June 2013) will focus on the commercialisation of nanotechnologies, exploiting its potential for new applications and taking them further from enabling technologies to end products. EuroNanoForum Call for Projects webpage lists the finalists. Research area: NMP-2007-1.1-1 Nano-scale mechanisms of bio/non-bio interactions. The BioElectricSurface project completed in September 2011. The project had set out to develop methods to manipulate surface charge on biomaterials surfaces by electrical modification. This surface charge is critical in mediating bio/non bio interactions in vivo and therefore very important in the area of medical devices. The project developed novel nanoscale techniques to obtain a quantitative insight into biological interactions on the biomedical device surfaces. The research provided valuable understanding of biological interactions at the nanometer scale and this understanding was applied to develop both plaque-resistant cardiovascular and urological stents; advancing new materials for rapid-healing orthopaedic implants; and producing MRSA-resistant self sterilising hospital gowns. When a biomaterial is placed inside the body, a biological response is triggered almost instantaneously. With devices that need to remain in the body for long periods, such interactions can cause encrustation, plaque formation and aseptic loosening on the surface. These problems contribute to the patient's trauma and increase the risk of death. Electrical properties, such as local electrostatic charge distribution, play a significant role in defining biological interactions, although this is often masked by other factors. This book describes the fundamental principles of this phenomenon before providing a more detailed scientific background. It covers the development of the relevant technologies and their applications in therapeutic devices such as MRSA-resistant fabrics, cardiovascular and urological stents, orthopaedic implants, and grafts. 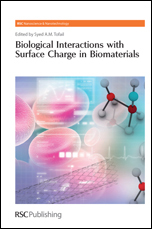 Academic and graduate students interested in producing a selective biological response at the surface of a given biomaterial will find the detailed coverage of interactions at the nanometre scale useful. Practitioners will also benefit from guidance on how to pre-screen many inappropriate designs of biomedical devices long before any expensive, animal or potentially risky clinical trials. Abstract Photocatalytic and in situ microbial activity of the amorphous and annealed states of Ag-doped and un-doped titania, were examined. Studies on their structure, morphology, composition and the photo-absorption characteristics of these materials, were performed.